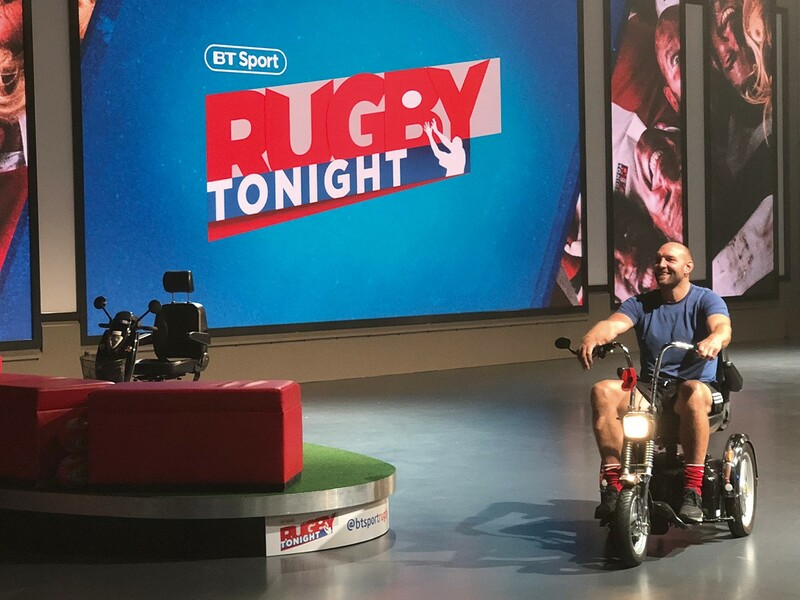 Driven by retired England international rugby players Ben Kay and Austin Healy, alongside Leicester Tigers prop Ellis Genge, TGA Mobility scooters supplied by Wheelfreedom have appeared on TV’s Rugby Tonight. Ellis Genge has recently been using a mobility scooter to remain mobile as he recovers from a knee operation. This led to a light-hearted feature during his appearance last week on the Rugby Tonight programme. Ellis was invited to race the show’s pundits, Ben Kay and Austin Healy, on three TGA mobility scooters supplied by Wheelfreedom, a wheelchair, powerchair and scooter specialist based in South West London. Ben Kay drove the TGA Supersport, a ‘Harley Davidson style’ black and chrome 3-wheeler; Austin chose the TGA Vita 4 with cutting edge styling; and Ellis selected the 8mph TGA Mystere. Introduced by show presenter, Sarra Elgan, the challenge was for the stars to race around three laps of a circuit laid out in the TV studio. The race commenced however Austin was unable to drive off as a practical joke had been played on him – his scooter had secretly been set to ‘Freewheel mode’. This meant the motor would not engage so he was unable to start the race. After several hard fought laps Ben Kay took the chequered flag on the highly manoeuvrable Supersport.